Jason and I met in 2006, the day before fall semester began, as he helped move my roommate, Vanessa, into our apartment. As a close friend of Vanessa's boyfriend Evan, I saw Jason often yet it took him until Halloween weekend at a party at the Standard apartments to finally ask me out. We spent our first date on Halloween day at Beyond Bread for lunch, one of my favorite Tucson spots, and then watching "The Shining" at my apartment at Entrada Real. From then on we were inseparable and spent the rest of our days at UA getting $1 cheese pizza slices at No Anchovies on Sundays, going to Arizona games, eating chicken tenders at Gentle Ben's, enjoying margarita Fridays at Bison Witches and just wandering campus together. Oh, and attending classes. After graduating in 2008, we both moved in with mom and dad as most grads do. For me, this meant Phoenix and for Jason, Orange County, California. Our time apart was brief as I quickly packed my bags and moved to California in January of 2009 so that we could be together. Jason proposed on Halloween day in 2009 and in 2011, we said "I do" on a yacht in Newport Beach. 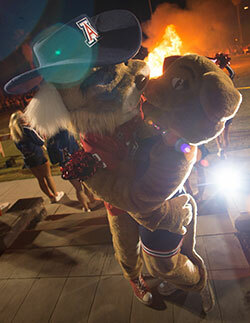 Through all of our years together, our love for the University of Arizona has remained. We've watched EVERY football and basketball game. We've attended March Madness games at Honda Center in Anaheim. We have UA flags in our house. Our cat wears an Arizona collar. This year, we took our UA love to a whole new level. On May 8, 2017, we welcomed our first child, an adorable baby boy we've named Olson. Olson's name honors the place where we met and fell in love, as well as our favorite Arizona coach of all time... the legendary Lute. We can't wait to take our Wildcat cub to the place we were so happy to call home for four years.